Manchester I L7324 crashed in the North Sea on 16/5-1941. The aircraft belonged to RAF 97 Sqn. Bomber Command and was coded OF-? At 23:00 hours a wireless transmission was received indicating that the starboard engine had failed. After that nothing was heard. The aircraft must have crashed into the North Sea. Pilot F/L Gerald O.L. Bird DFC, Sgt Peter N. Nutt, P/O William A. Brown and Sgt Reginald G. Pyatt have no known graves and are commemorated on the Runnymede Memorial. 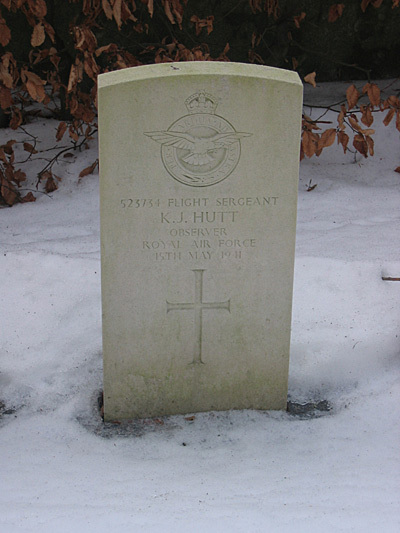 On August 4. the body of F/Sgt Kenneth J. Hutt was found drifted ashore on the beach of Grønhøj near Blokhus by tourists. Receiver of wrecks Frøstrup had the body taken to his farm and from there to Frederikshavn cemetery where it was laid to rest on August 7. 1941. A German Field priest officiated at the graveside ceremony. Sgt. Wallace P. Hannigan was found on the beach near Furreby and laid to rest in Furreby cemetery on August 5. 1941 as a unknown member of the Royal Air Force. In October the same year Wine Merchant Ole Christensen of Viborg had a memorial stone made for the grave. He also committed himself to maintaining the grave. 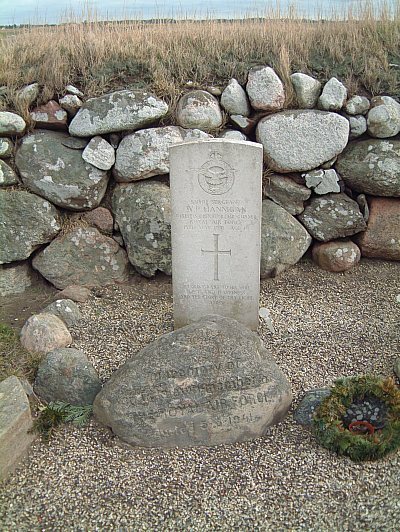 He did so until 1973 when it was handed over to Commonwealth War Graves Commission. Sgt Wallace P. Hannigan was identified by the British Forces after the war.